Africa-Mali-Djenne Really enjoyed this place.. I always say it is real Africa.. It is all about the people and enjoying the real life. No tourists about when I was here. A limited supply of stamps , but at least the cards made there way home. Two months. 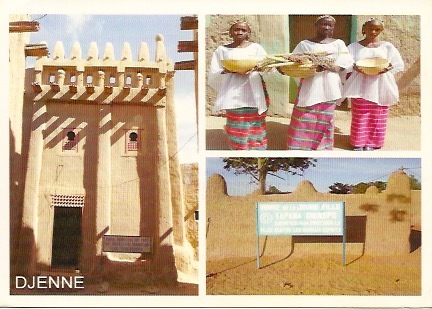 The Postmark says "Postes Mali - Djenne. 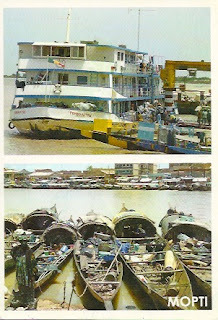 Africa-Mali-Mopti A very enjoyable town to visit. A river port where you see all the ferries and the towns they visit. The River is only active from August to December when the water is sufficient . This card is showing a selection of stamps that were available in the Post Office in Mopti. Hard to read anything on the Postmark. 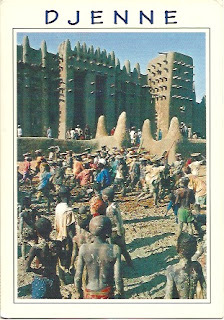 Africa-Mali-Djenne What a wonderful place to visit. The Mud Mosque was everything that I had expected. A wonderful place to visit. A World Heritage Site . The Post office had limited stamps in Djenne. I think the same post office has been there for years. The Postmaster was very helpful and let me go through his books of stamps so I could try and get a few different stamps. Most of the stamps the value is too low. So the 450f stamp is required down the bottom. 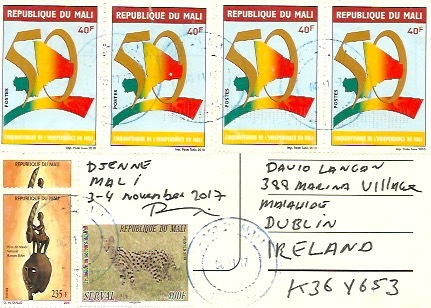 The bottom postmark is " Postes Mali - Djenne.